Jelly Bean 4.1 update has been available in more and more regions since February. Now our almost 1.5-year-old Note get a new life again after the Ice Cream Sandwich update last year. If the rumor can be trusted (and it is usually can be trusted), Galaxy Note will get Jelly Bean 4.2 update this year as well. Even better news for Galaxy Note 2 owners, Key Lime Pie (aka, Android 5.0) update will very likely be available for your Note 2. Well done Samsung!. Now Samsung is only second to Google in providing update for their Android handsets. Last November, we list top 10 expected features in this Jelly Bean update for Galaxy note. After testing the update recently, we found all features mentioned except Airview were included in this update. Some of these new features and improvements are part of Jelly Bean update, for example Google Now and popup browser. 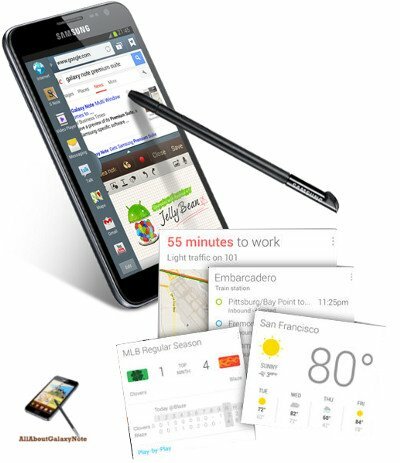 Some are Samsung’s extension or exclusive apps, for example, multi-window, Paper Artist, and easy clip. In this post, I will share with you 12 must-try new features in this Jelly Bean 4.1 update in your Galaxy Note. All these features are already available in Galaxy Note 2, Galaxy Note 8.0 and Galaxy Note 10.1. So, if you own Galaxy Note 2, Note 8.0 or Note 10.1, you can also try all these features out of box. Google Now is the killer feature of Jelly Bean. It was officially unveiled in Google I/O 2012. With Google now, you become the master, not the slave of your smartphones. Google Now essentially digs all your info in your Google accounts, then predicts what info you may need before you ask. The info is presented in “cards”, which are presented once you start Google Now. In Jelly Bean 4.2, more cards will be available. Of course, you can also use Google Now as knowledge navigator: simple ask questions, Google Now gives you results in natural language. It works far better (not so arguable) than Siri in iPhones.